Tom Wooley transferred to Valpinomar apartments in Calahonda on 15/8/18 with five members of his family. Upon departure he answered all eight questions on our questionnaire. 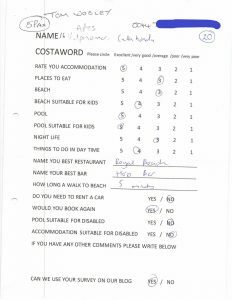 His accommodation, including the pool and beach, was awarded top marks with a five . 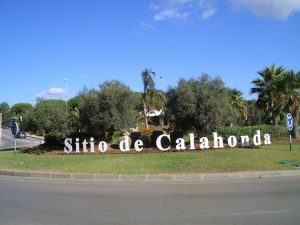 Tom stated that his party would stay in the Valpinomar apartments in Calahonda again as it was only a five minute walk to the beach. He awarded places to eat and the nightlife an average of three. Tom commented that his favourite restaurant was The Royal Beach which is situated on the beach at Mijas Costa. This popular restaurant serves all types of food, wines beers and many different choices of cocktails. Tom and his family also enjoyed the Harp Bar, which is a drinks only bar. His party particularly liked the friendly staff and stated it was a perfect place for pre dinner drinks. Sandra Irwin travelled to Malaga with 9 passengers in her party and was met by driver Andy. Sandra particularly liked staying in Mijas Pueblo at Casa Adelante, and would definitely book again for a return holiday. 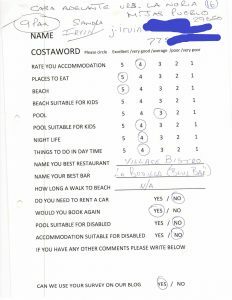 She gave top marks to the beach area and places to eat, rating the nightlife and daytime activities all good. Sandra’s favourite restaurant was The Village Bistro which serves salads, sandwiches, baguettes and also popular English cuisine. Enjoying many evenings in Vinoteca la Bodega el Pintor which is located in Mijas, Malaga. This restaurant is characterized by its wide range of wines and its Mediterranean tapas. It counts on a modern, traditional and sophisticated atmosphere serving lunch, snacks and dinners. She thought it an ideal place to go with her family and friends.